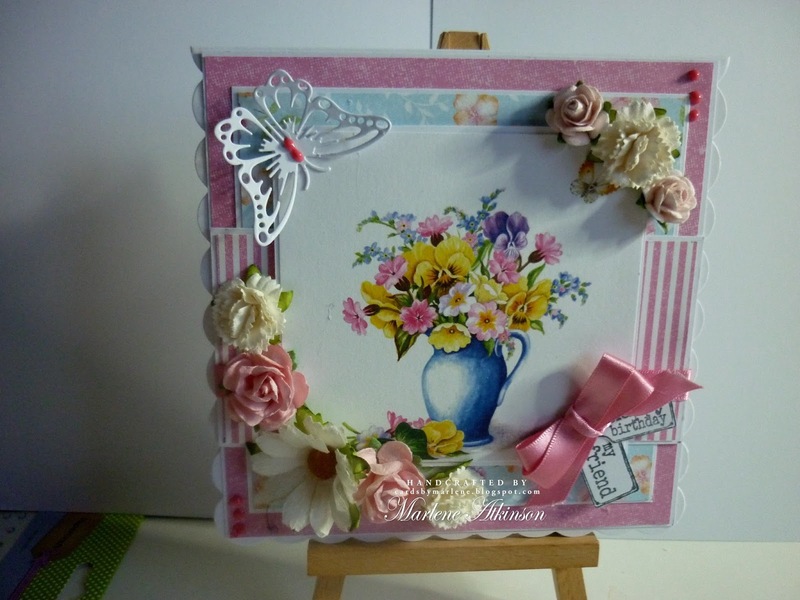 Jackie is hosting our challenge today, and the theme is Floral Profusion. 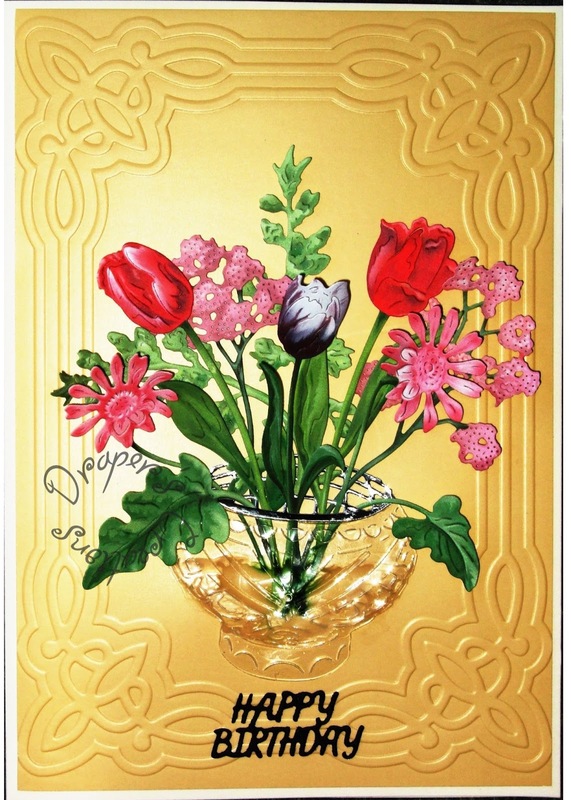 We would love to see your creations covered in flowers, lots of flowers. Please do not enter with just one flower as that is hardly a profusion of flowers! 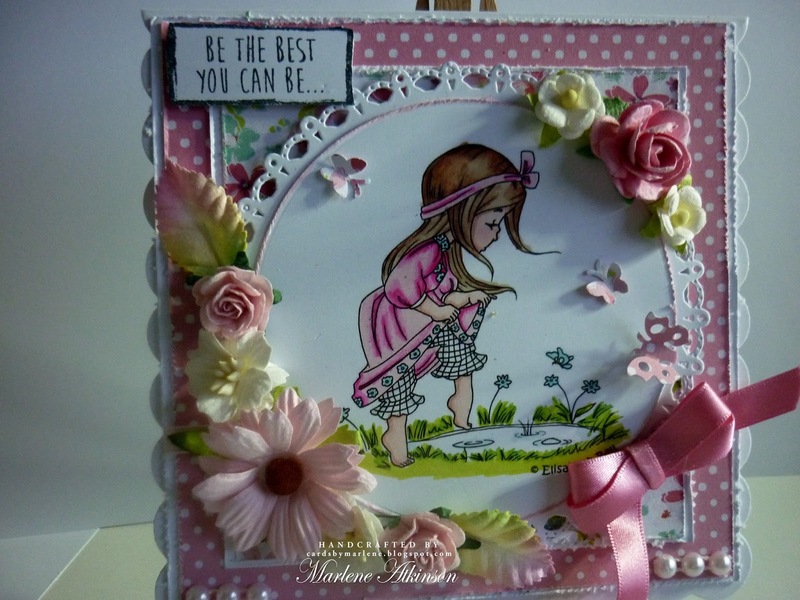 As usual anything you care to enter is fine, a card, scrap layout, mixed media piece, some home decor, as long as it has lots of flowers on it. Please remember our 15 total challenge rule! My card was a get well card for a colleague in hospital. Real flowers weren't allowed so we sent paper flowers instead! 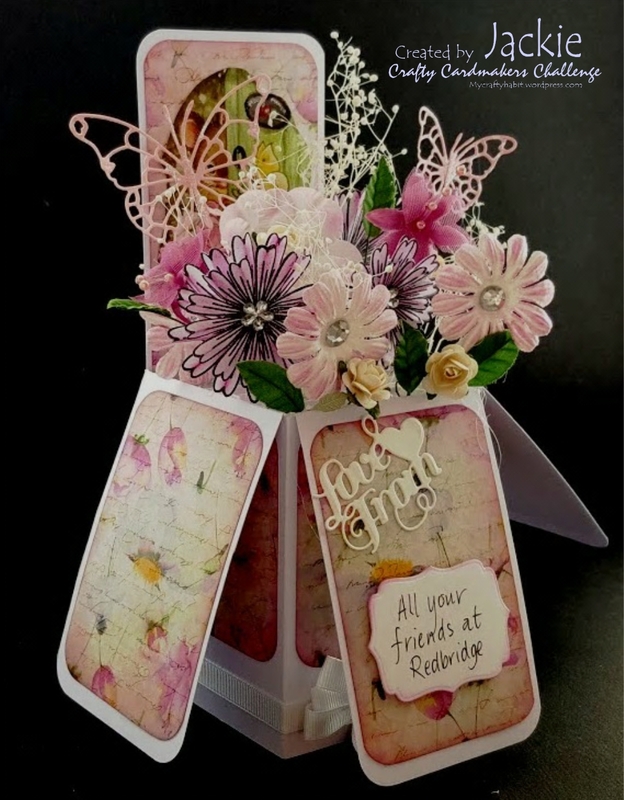 I used a combination of bought and hand made paper flowers for my pop up box card, along with some die cut butterflies. 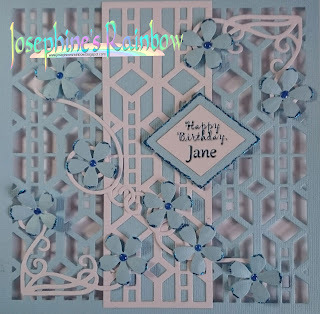 A card for a colleague who's having a special birthday, loves blue and is and leaving within a few days. I've used dies from Sue Wilson, Crafter's Companion, Spellbinders and Sizzix along with a computer-generated sentiment and a little glitter glue. 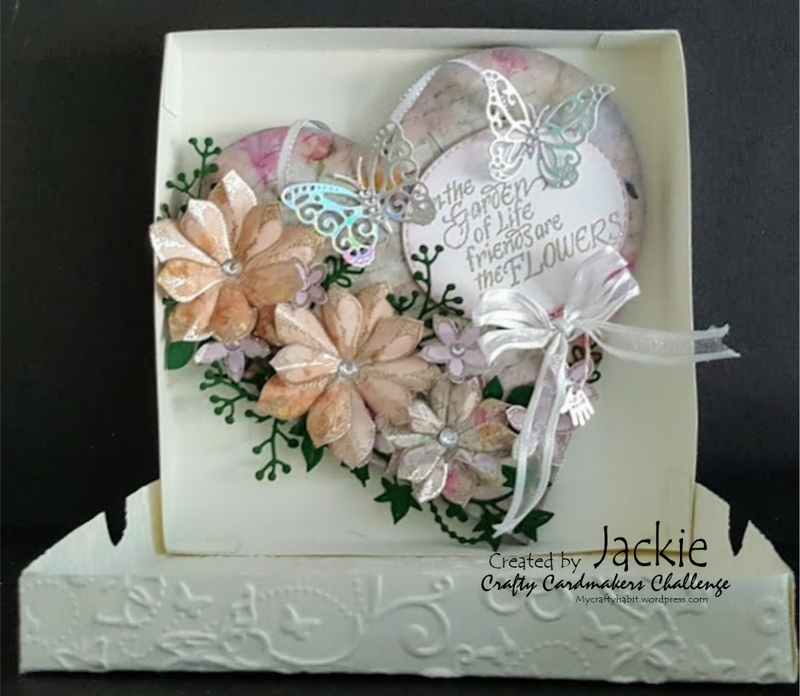 I used Tattered Lace's Sweet Serenity Blissful Blooms CD ROM and matching dies together with a Tattered Lace embossing folder. I used a clear stamp 'Shadow Flowers' by Local Rubber King for the main image, and punched out the four small flowers with paper punches and used a Memory Box die called 'Fabulous Phlox'. for larger corner flower. 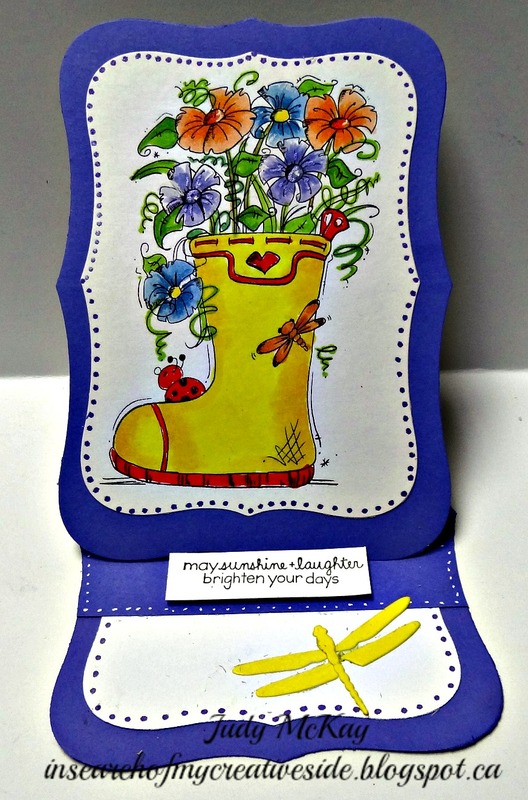 I made this easel card for a friend that has been feeling under the weather. I hope that it cheers her up. 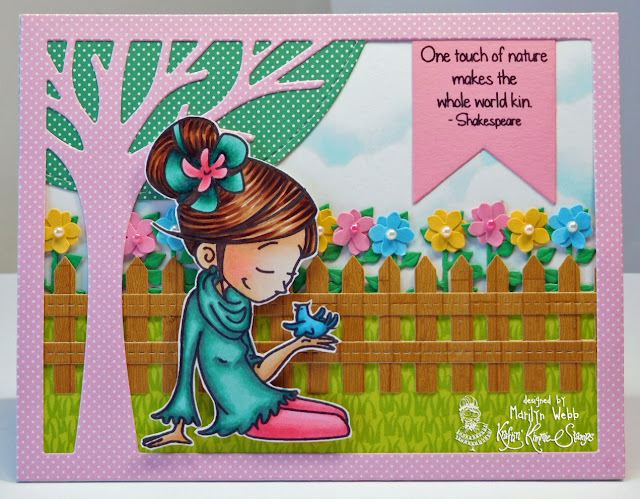 The image I used is from Bugaboo Digital stamps. I coloured the image with copics, gell pen and glitter. To complete my card I added a die cut dragon and a sentiment. 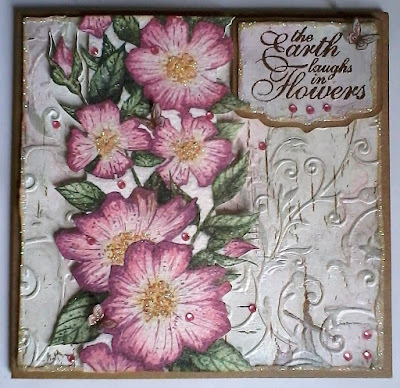 I love adding flowers to my feminine cards so I really enjoyed the theme on this Challenge. 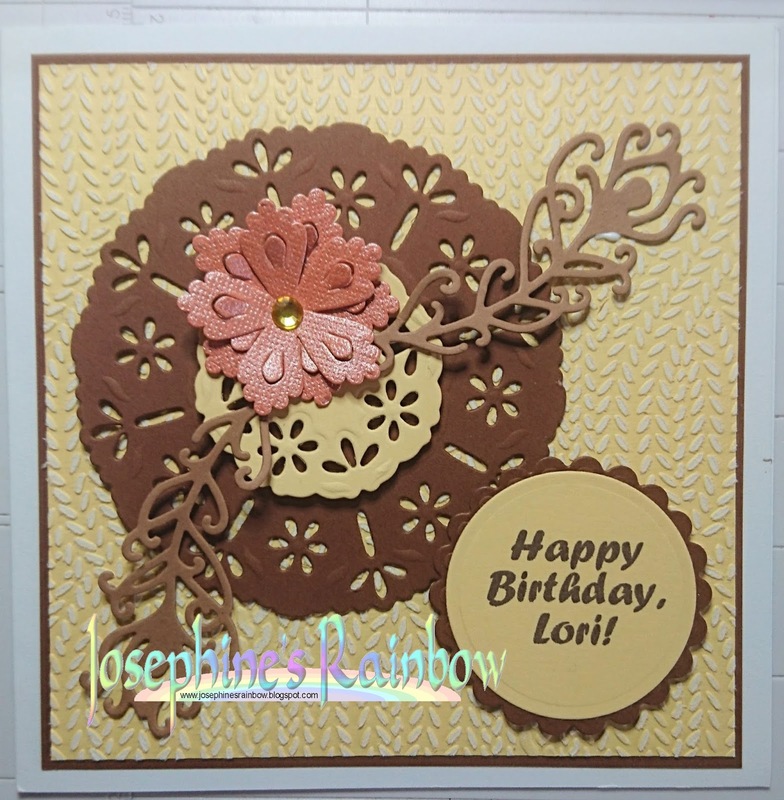 Papers used are from Maja and I have added a piece of lace at the side and also did a little stenciling with translucent texture paste. 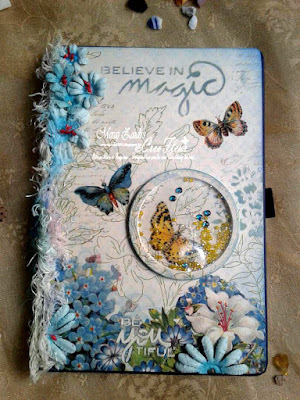 Added some gauze under the flower cluster and included a few berries, gem sprays and die cut leaves as well as some randomly scattered prills. 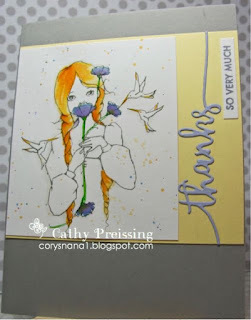 Cut this cute little gift bag on the Cricut using the 'To You From Me' cartridge, used a sentiment stamp from Papertrey Ink and then added lots of Prima flowers and then some pearls. I have used two stamp sets from Hobby Art and watercolours to make my card. I used Art Impressions watercolor stamps for this challenge. Still learning with these stamps, but they are a lot of fun. The sentiment is from Simon Says Stamp. Card for First Communion. It is for a boy so I used blue papers and flowers. 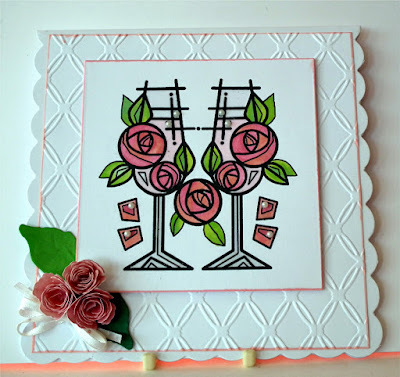 I used a free svg by Diana Tunnicliff for this card base. 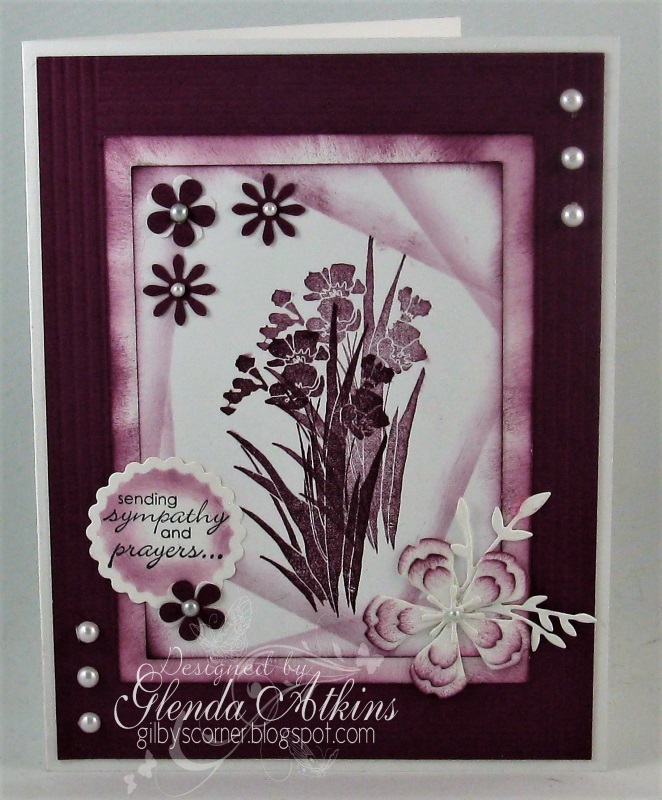 I cut it in Cricut Design Space and added some Anna Griffin flowers, sentiment, ribbon and pearls. 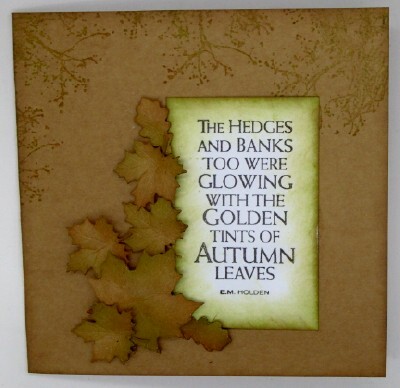 Pam is hosting our challenge today, and the theme is Add A Sentiment. It would be nice if your sentiment is not a tiny peel off tucked in one corner, but more the focal point of your creation, but we won't insist on that. 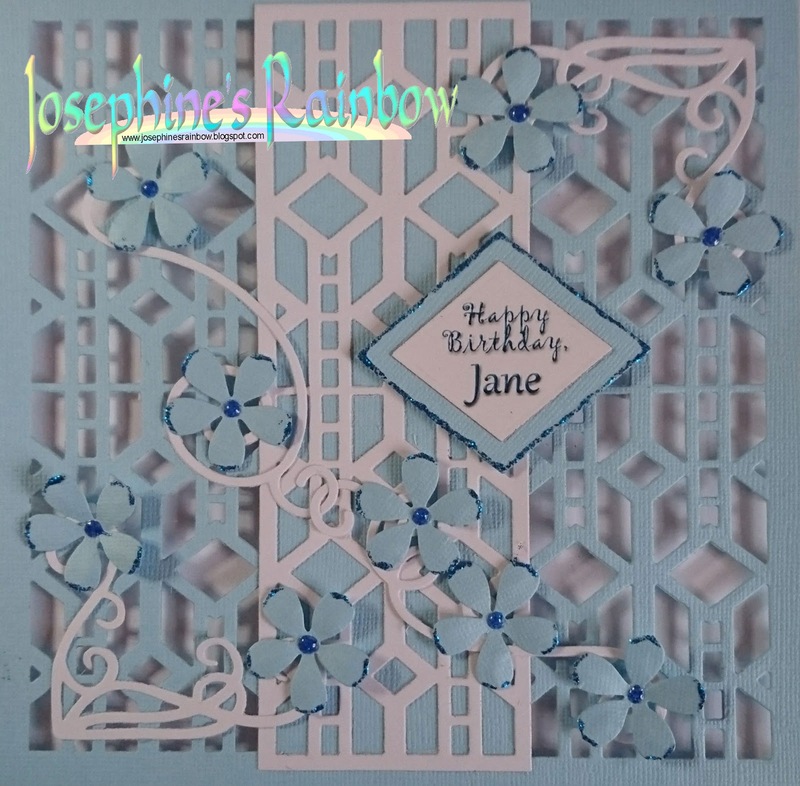 As usual anything you care to enter is fine, a card, scrap layout, mixed media piece, some home decor, as long as it as a sentiment, the more prominent the better. Please remember our 15 total challenge rule, and to link directly to THIS POST and not just the front page of our blog please!! 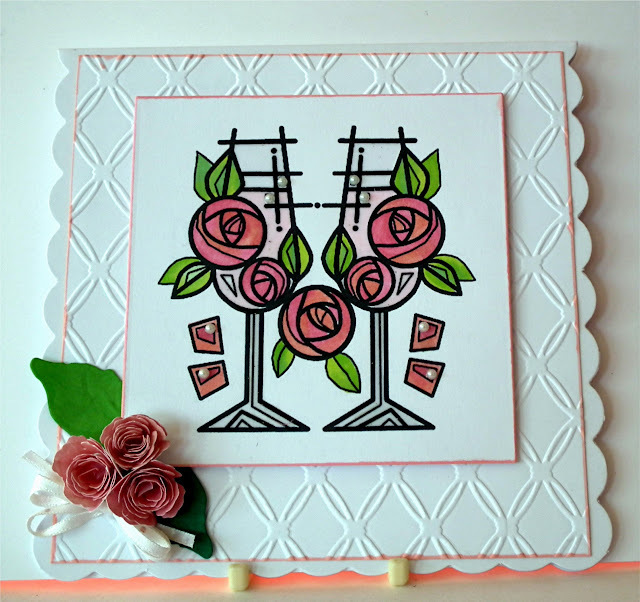 I used an embossing folder and distress inks to create the background for my card. 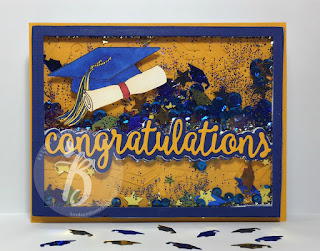 I topped it with vellum and heat embossed the sentiment. I love quotes and sentiments, have collected both for years. 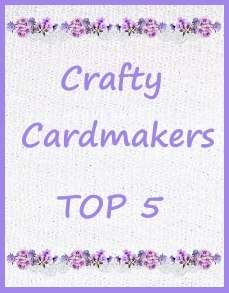 I am looking forward to seeing your designs! Image is from Just Inklined and is called 'The Good Life. 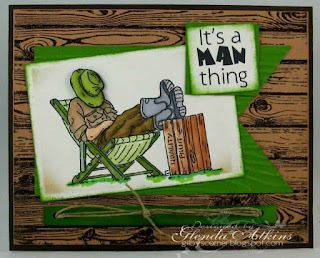 The background is Stampin Up's 'Hardwood and is heat embossed, The sentiment is an old Doodle Pantry digital stamp. 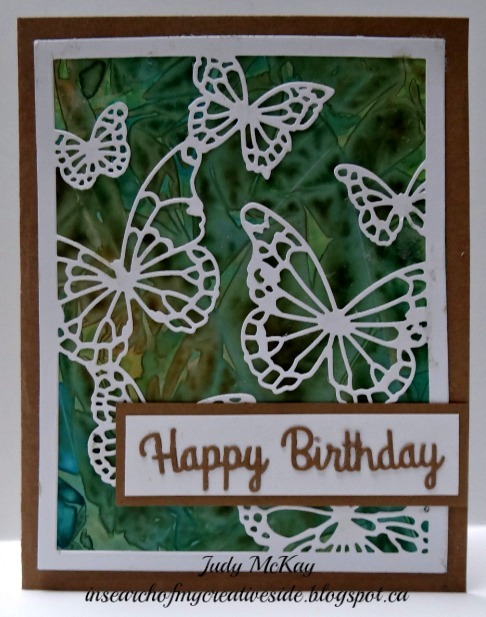 I used a large floating butterfly die for my card which I cut out in white. 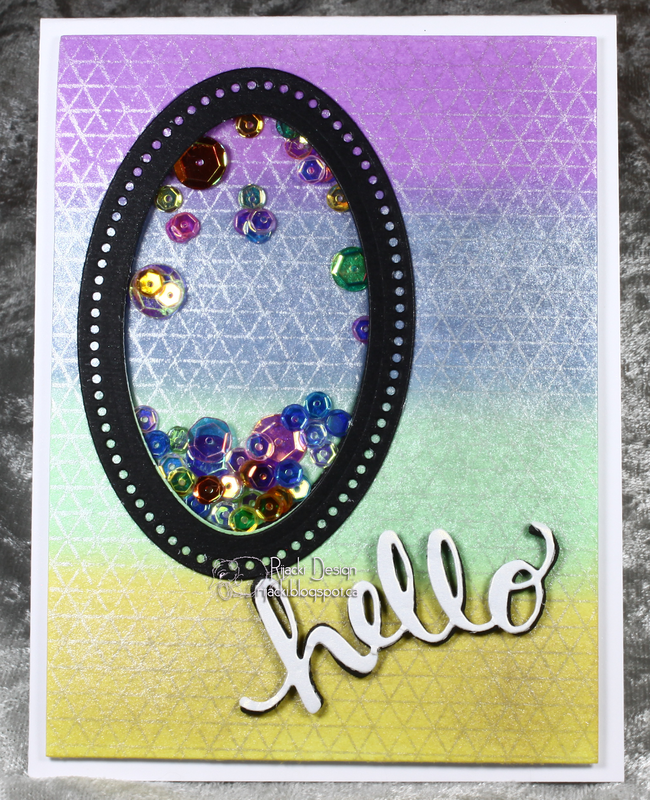 My background was made in a fun technique called Shattered Glass. 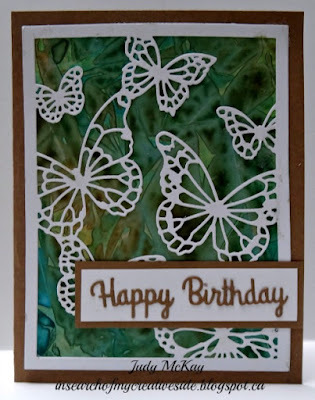 To complete the card I used a Happy Birthday sentiment die and painted the butterflies with A wink of Stella. I've used a die and embossing folder from Crafter's Companion with other dies from Spellbinders and finished with a computer-generated sentiment for this card for a friend. 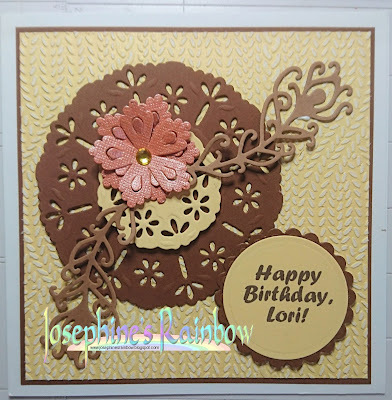 I used various dies from Tattered Lace to make this card for a friend's mother. Hello everyone! 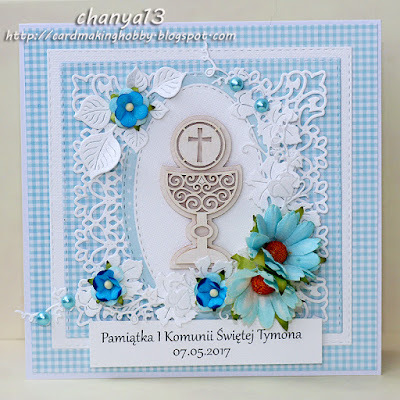 My card was created with papers from Maja Design and some pretty flowers and lace from Megs Garden. The leaf die is by Cheery Lyn and I have added a piece of gauze and a twine bow to the cluster. 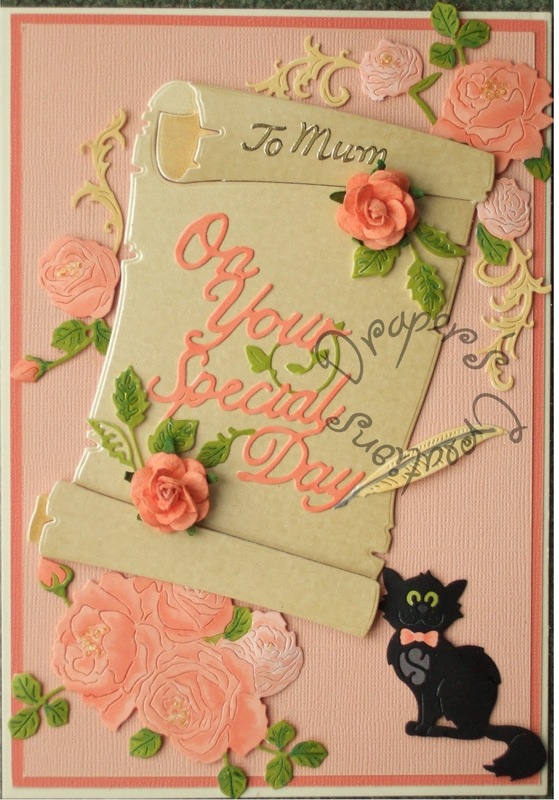 The sentiment was stamped onto a piece of cardstock and heat embossed. My card is a Double Z fold card. 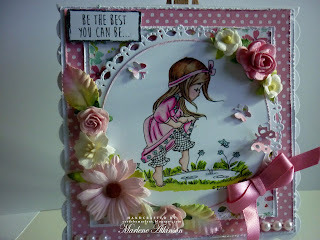 The tutorial for it can be found At Beccy's Place. 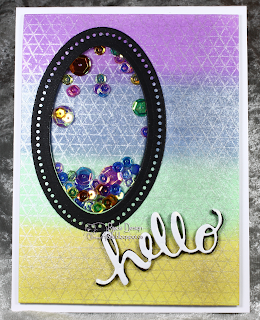 The background paper is from the new Anna Griffin Eleanor paper pad. I cut all elements except the flower with my Cricut Explore. 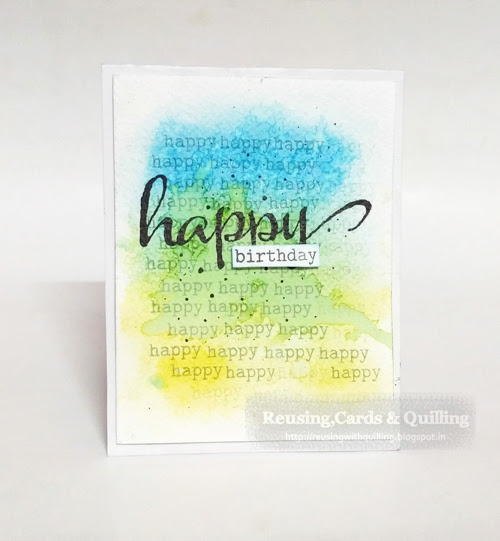 The Happy Birthday sentiment was created in Design Space and the inside sentiment is a Close To My Heart stamp. 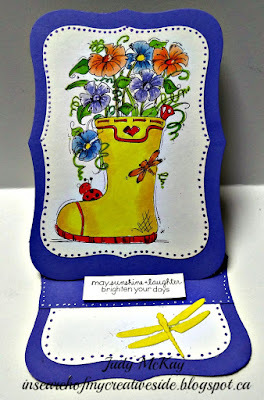 When I planned the card for this challenge I remembered that I have a special love for "punny" sentiments. 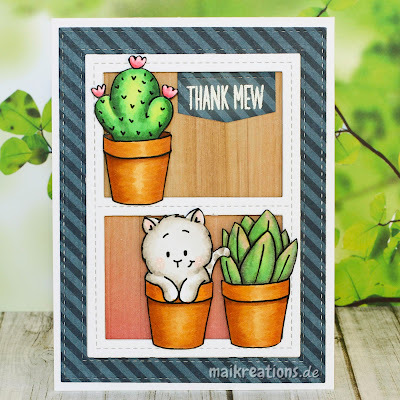 I often need "Thank You" cards, so I thought "Thank Mew" would work perfectly. 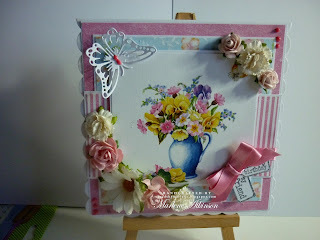 The images are all from the current Gerda Steiner Digi Bundle and the frames I used are MFT Blueprint dies. My card has been created using a stamp from Hobby Art and some die cut leaves.